Both of my nieces have turned one this year and both have partied like it's 2010. I'm so glad they are in my life and I look forward to attending more birthdays in the future. This week my husband and I traveled via Southwest (they are wonderful) to give his family a nice surprise just in time for little Mac's 1st birthday. Today was a fun-filled sugar-high day. My sister-in-law hosted a really great party for her daughter. 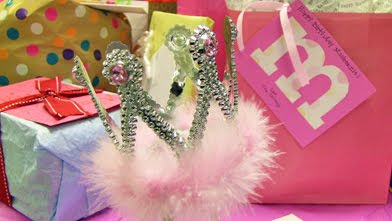 The theme was pink with lady bugs and a whole lot of gifts for the kiddies. 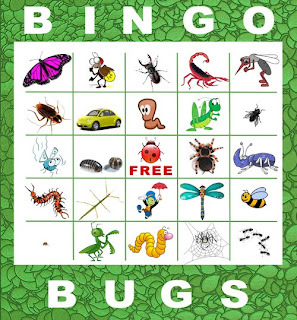 One idea that was a big hit was a version of Bingo except with a variety of bugs instead of numbers. The ladybug was the free cell on the sheet. My husband spent the wee hours of the morning working his magic with his wand called Photoshop. We printed the sheets at FedEx Kinkos and two people thought it was genius. He calls it "Buggo" and I call it "Bingo Bugs" but I think "Buggo" would be a better pitch for sales. 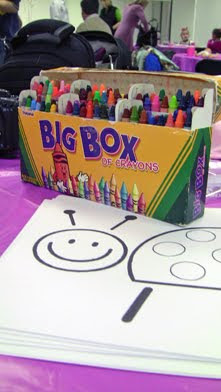 Another activity that was included was a Lady Bug coloring contest. My husband and I were the judges for the contest. I must admit, it is much harder to judge kid's artwork than adults. I don't have the heart to ruin some two year old's artistic aspirations. Oh well, there were enough gifts to keep the children satisfied. *Yawn* I need to get some rest from all the sugar and energy exerted trying to keep up with the little tots. Will Write More Soon. My husband was raised on mac n' cheese so I wanted to come up with a creative way to re-introduce him to this past standby. On my side of the family, macaroni and cheese was an American treat for us kids. So either way I had to whip up something fast and hearty that we both could enjoy. Last night I created a recipe that will probably be inducted into our family's Food-Fast menu. We like to call it "Spicy Mac n' Cheese." The key to this recipe is using Niman Ranch's Chipotle Cheddar Uncured Sausage. I purchased this from Whole Foods. One package costs around $5.00 depending on your town. I love packaged/deli meats but I get migraines that are potentially triggered by nitrates found in packaged meats. So anytime I can find a "no nitrates added" 12 oz pack of sausages plus chipotle spice, I will try it. It is confirmed: Niman's Chipotle Cheddar Sausage Rules. Slice the sausages according to your preference. We sliced them thin. Heat skillet or pan on med-high. When the pan is hot, place your sliced sausages in the pan. Use tongs to continuously toss the meat around so it avoids getting burned. You want the flavors in the meat to get juicy and the texture to caramelize. Once that is done, set aside. Cook your mac n' cheese according to the instructions on the box. Once you've finished making your mac n' cheese, combine the sausages into the mac n' cheese mixture. In the baking dish, spray your non-stick cooking spray and pour your mixture into the pan. Sprinkle 1/2 C of bread crumbs on top and bake for 20-23 minutes. If you want more crispiness on top bake longer but keep an eye on it. I would hate to have anything this good burn into oblivion. Enjoy the your Spicy Mac n' Cheese! Well, what do you know? There IS such a thing as wishful thinking come true. My husband and I were talking one time about the kind of office we'd like to have. He mentioned how cool it would be to have a standing desk and even better, a treadmill attached to it. 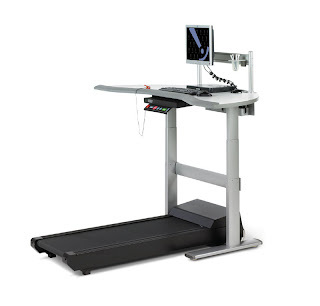 I found this desk+treadmill gadget on PointlessbutCool's blog. I researched the product a little more and found out that this idea was made real by an innovative company called Steelcase. They call it a "Walkstation." I can't just leave you with one gadget today. Another cool thing I found was a folding silicon funnel that folds flat for easy storage. This beats forming a makeshift funnel out of aluminum foil...thrifty and nifty but no cigar. This funnel runs for $7.95 on Solutions website. 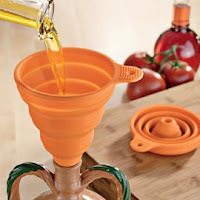 If you have any cool blogs and websites you visit for neat household gadgets please do share! Have a relaxing evening. Cooking to me is part of staring your own family traditions or keeping it going. My mother made homemade pizzas and now I'm learning to make my own homemade pizzas, including the dough. I've always been a little fidgety with making dough or anything relating to dough production. Love the carbs though....love it. Now for this recipe you can use an electric mixing bowl but until I get a Kitchen Aide mixer, I think using my bare hands is the best way to go. So this recipe is strictly written from the perspective of Old School-ness. There's just something about using hands to prepare food in such a way; it's a quality that is hard to come by these days. Just remember, ladies and gents, to place your rings in a safe place when it is time to form the dough. Let the goodness begin. In the large bowl: Combine flour, salt, Italian seasoning and powdered garlic. In the small bowl: Sprinkle the yeast into the 1/4 C of lukewarm water. Then gently mix in sugar. Let stand for about 15 minutes in a warm area until yeast develops into a foam. Back to the large bowl, create a hollow in the flour mixture. Pour in the yeast mixture and olive oil. Gradually pour 1 1/2 C of warm water. 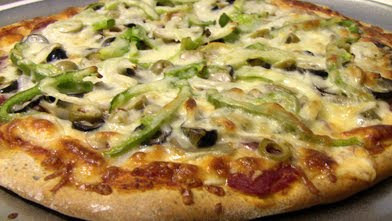 Keep an eye and feel for the texture of dough as you combine the dry and wet ingredients. You want the texture of dough to be elastic but not as sticky. Adjust that texture with a little flour or water depending on the dough. If it gets too sticky add a little flour. Adjust your water accordingly until you end up with a ball of dough that is ready for a little kneading. Sprinkle some flour on clean surface. Knead dough until it has a smooth texture. Put a little elbow grease and love in it. For a detailed look into why we knead dough and what to look for, let the bakers at Red Star tell you how it's done. Now place the dough back into the large bowl. Cover the bowl with your damp cloth and let the bowl sit in a warm environment for about an hour or until the dough is twice it's size. During this time make sure you preheat your oven to 375 degrees 30 minutes prior to baking. Once dough has risen, divide the dough in two. Knead dough and begin to form your pizza crust with your rolling pin. Once you have your crust formed add your favorite toppings and pop that pan into the oven for about 20 minutes. I don't like to assume that everyone has the same oven. Your oven is probably better than mine but do keep an eye and nose on your pizza during this time. Your crust should be golden and the cheese bubbly on top. Mmmmmmmmmm. When I go dining I avoid eating anything close to "asian-inspired" cuisine that includes rice on the side. There have been too many stories and excuses from family and friends who do not feel confident cooking rice. I hurt for them because I know what really great rice feels like when it hits the bottom of my belly. So for all you Rice Lovers out there I hope this article helps. Warning: This tip may cost you a couple of dollars but it will be worth it when you are praised for making such delicious rice. First of all, let's talk rice. Rice comes in different textures and flavors. For instance, Indian cuisine is best with the aromatic and delicate basmati rice. I have great memories at my friend Priyanka's house when her mother would be simmering chicken curry and the blending aroma of rice, curry and naan bread would fill the living room. Okay, so where was I...yes, rice. 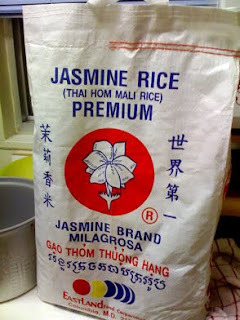 The best rice for Southeast asian food would be jasmine rice. Like the basmati it too is aromatic but a little fatter in grain. When I make a Thai market run, I always stock up on a 25 lb bag of "Thai Hom Mali Rice" (literal translation: Thai Aromatic Jasmine Rice). 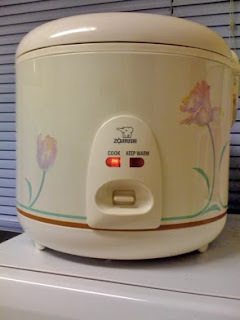 Now, if you can spare some money in your budget for a rice cooker I'd like to recommend this brand: Zojirushi. Researching online and reading reviews was well worth the effort when I signed up for one on our wedding registry. We use it all the time and it's so simple to cook great rice now. Before that we used to make rice with a sauce pot and a ceramic plate. It was always a hit or miss. Here's how we do this thing! 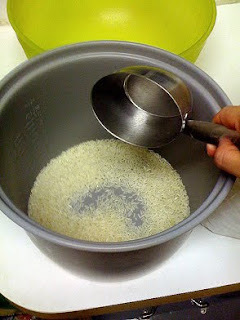 Using a 1 cup measuring cup for dry ingredients, scoop 2 cups of rice (1 cup if you want less). With each scoop you want to add the same amount of cold water into the cooker. Here's a little tip, if the rice is "new crop" then the ratio is 1:1. If the rice is older and in time your 25 lb bag will get older (but still good) you want to add an extra cup of water in order to keep the rice soft and moist. So if I'm working with older rice and I've placed 2 cups of rice, I would then add 3 cups of water. Have I confused you yet? And the final touch, just press down on the button and your rice cooker's button that says "cook" should be the one lit. Give it 10-15 minutes. The button will change from "cook" to "warm" and that's when you give it about 7 more minutes for the rice to absorb all the moisture. 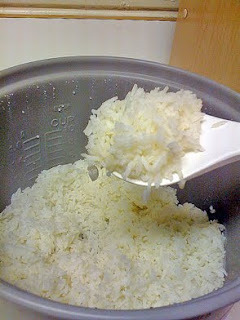 Then, open the cooker and fluff the rice and, voila! Rice you can be proud of. Yes, Yes, Yes! I'm so excited I had to share this tip with you. Every time I've done it, I'm always left disappointed but today is different. I'm going to try this after I finish this blog. It's probably not just a bedroom-only thing, you can do it anywhere you please. By the end of this video you will "beam" with elation or just sheer pride. I'm talking about folding a fitted sheet. My sister said my mom taught her how to fold one in highschool. Where was I? I swear I must have been such a bonehead at the time. A couple days ago my husband and I were talking about what films we'd like to see in 3D IMAX this year. My first true 3D experience was two years ago with the movie Journey to the Center of the Earth, featuring Brendan Fraser (he hasn't come a long way from Encino Man, but we love him). Yes, I know, the plot was not the most captivating but the 3D visuals were quite entertaining. To be honest Indiana Jones and the Kingdom of the Crystal Skull was a bit more disappointing than Fraser's film. Sorry, Mr. Lucas but I know you can always redeem yourself. Well, ever since then we too have tried to redeem ourselves of new and worthwhile movies in 3D. The best place to catch one would have to be at an AMC near you. It's free to sign up for a Movie Watcher card and with each visit you build points that offer concession rewards that will help you save. I have been a big fan of this establishment ever since my mass media class was given a tour of our local AMC. I became a more loyal fan when they offered A.M.Cinema; all movies before noon are half price. Wonderful, yes? For detailed information on the dates for the films above and more you can check out The Movie Insider website. Last week, we had an 80s weekend watching The Goonies and Tron. Before we watch sequels, my husband and I make it a tradition to watch the film previous to the upcoming one. In April or early May, I'm sure we'll be replaying Iron Man and Toy Story 2. It is much fun to be married to someone who enjoys creating new family traditions. "3d glasses" Image courtesy of Jentymom from Flickr Creative Commons. I hate dust. I dislike dusting. It's been a battle for me since I was child. I was always on cleaning duty and living near a main dusty road didn't help my chores. Today I'm still on cleaning duty and there is dust on my counters, on my dresser, night stand and under the bed. Oh wait, in my bathroom as well. So to motivate myself I ended up browsing and reading some articles of what other do to fight dust. My weapons of choice are usually a bucket of water with a little Pine-Sol (Sparkling Wave scent), two cloths (one damp, one dry), a mop for hard-to-reach locations and my trusty vacuum. 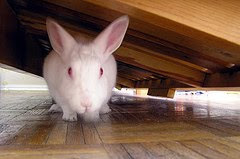 Before I go damp on dust, I vacuum as much of the wooden floor and corners of dust bunnies and anything resembling a cloud of lint, hair and more dust. When using the vacuum, I combine the hose and the angled tube, this works best for me. Once that is completed I wet one cloth or the mop in the bucket and wipe from side to side catching dust without returning it to the original spot. Circling your wipe will still require you to wipe side to side in order to get it right. Next, get your dry cloth and wipe up the light moisture in order to avoid damage if you are working on wooden surfaces. Clean, dry furniture is happy furniture. So there you go, your home is dust free (for the time being) and you are left with a light crisp scent of the what the ocean smells like, according to the makers of Pine-Sol. If not Pine-Sol, I'm sure there are plenty of natural disinfectant options that I think are fantastic especially if you have children around the home. Learn more about dust on Dust.com. Find out more strategies on how to defy dust with Reader's Digest.com. Need more time for other things? Speed Clean Your House with MSN and Redbook. Best of luck fellow Household Keepers. "Dust bunny. :-D" Image courtesy of gmpicket from Flickr Creative Commons.